We have put together an online survey to get your feedback and know your interest for providing Islamic Studies/Activities for your children during the Summer Camp Program. Your participation will determine if we will have the program. The survey has no limits on who can take it, however, If you plan to be a part of the program in any way (Teacher, Parent, Volunteer, Assistant etc) it is mandatory that you attend the meeting that will be held on June 1, 2014 at 7:00 PM Insha Allaah! Your input is very important. So please take a moment and take the survey. Don’t miss the Spring Yard Sale!! The tables can be purchased in advance or the day of sale. Only limited tables are available so please make sure you purchase the tables in advance. If you decide to purchase the table on the day of sale, please be aware that they will be available on a first come first serve basis. The money collected will be donated to the Masjid and the Islamic School. The crescent of Ramadan was not sighted this evening. We will therefore complete 30 days of Sha'baan tomorrow (July 9, 2013) and begin the month of Ramadan on Wednesday July 10, 2013, insha Allah. We will start praying Taraweeh tomorrow (Tuesday July 9, 2013). We will also post the timings for Taraweeh on our website. Please check the site periodically. We pray that you have a blessed Ramadan. On behalf of the Weekend Islamic School, we would like to invite all of the sisters in the community to participate in our first Women’s Health and Nutrition Panel. The goal for this program is to allow sisters to benefit from the existing expertise in health and nutrition from our own community. We want to continue this program on a monthly basis insh Allah. This effort will also strengthen our sisterhood. The long-term goal is to start a free clinic. We have arranged a day-long seminar in the main musallah for the brothers as well. So the whole family is invited to attend this event. Please disregard the statement about the social gathering in the previous email. That sentence was from last year and did not get removed. Please send us your email if you want to be part of the preparation and we will add you to our internal mailing list. Also if you want to help don't forget the meetings on Friday between maghrib and Isha. We would like to inform you that our yearly "Share Islam Day" will be Insha Allah on Saturday April 20th between 5:30 pm and 7:30pm. 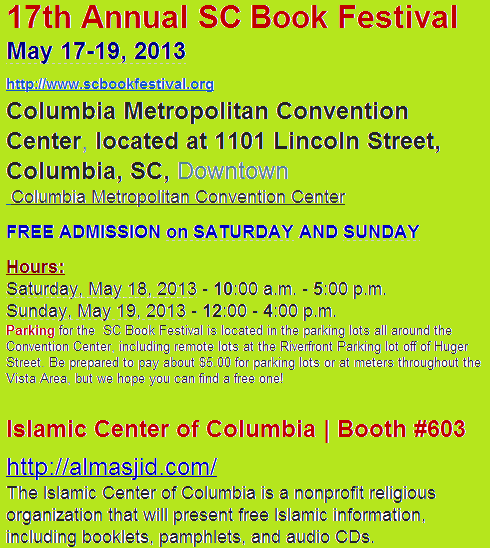 Please invite your neighbors, coworkers and any non-muslims you know. 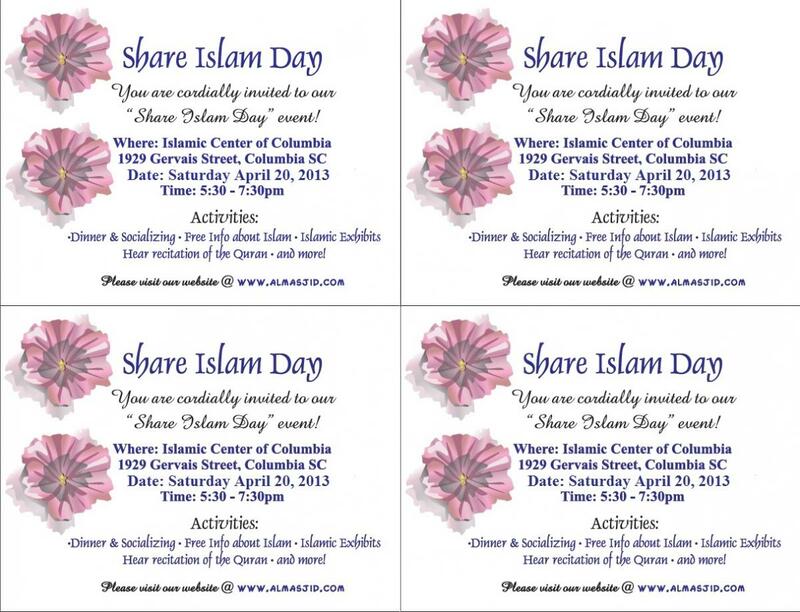 Share Islam day is basically an open house event where we invite non-muslims to come see our masjid and our community. We tell them about Islam through a short (20 min) lecture and some display tables. We also offer them free material about Islam. Dinner is also served at the end of the event. Due to the great effort and time consumption in the preparation for this day we will not have our monthly social gathering this Saturday but we ask everyone to come to the Share Islam day instead to greet and spend time with our guests, show them our Masjid and tell them about our religion. We are currently meeting every Friday between Maghrib and Isha to prepare for the day and we need volunteers. If you have time and would like to help please come to our meetings.